Fork!! a photo by BaboMike on Flickr. 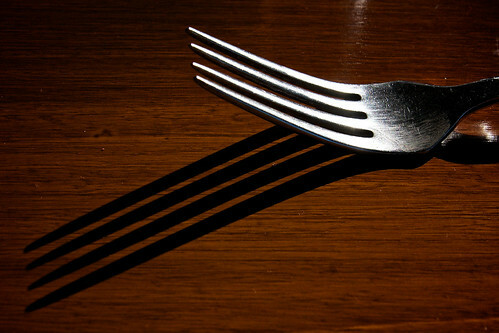 Sitting here, watching the F1 online (thanks OneHD) contemplating this fork. What to write. Where to start. Ok. I have it. Last weekend, Voyager Estate. This weekend, Meadowbank Estate. Which is better? Not sure. Truly. No wait. I’d put Voyager ahead, but not far ahead. Both Vineyards with great restaurants. Both amazing food. Both Brilliant. One 12 hours+ from home, one 20mins from home. Voyager is a “higher” class establishment, however I wasn’t drinking at Meadowbank so couldn’t raise its class that way. Either way, a bloody good meal. The lamb was superb. A bit of an early birthday lunch for Susie, courtesy of her dad, Ron. We started the day out in Richmond. Lots of photo’s of the bridge, the church etc etc. The usual tourist stuff. Then on to wine tasting and lunch. Why a fork? Not sure. I liked the shadow, the shiny, the pointy prodding. The light coming through the windows was bright casting the shadows. It just worked I think. Tomorrow, work. But its a short week. 4 days, and next week is 3 days. Brill.